When you enter into a bail agreement you are making a promise that you will appear in court on a specified date and time. Bail agreements may specify a monetary amount, which you only have to pay if you breach your bail. A cash bail is one where you are required to pay the sum up front when entering the bail agreement. You get the money back (provided you don’t breach your bail) when the case is finished. A bail agreement can also specify certain conditions of bail, for example you may have to reside at a particular address, or obey a curfew, or be under supervision of a probation officer. your bail (or in the case of a cash bail, you may forfeit the amount you have already paid). 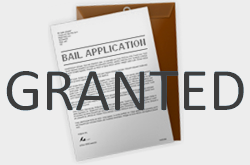 A bail agreement can also require one or more sureties. When someone acts as guarantor for you they are making a promise that you will appear in court at every required hearing and will obey all the conditions of your bail agreement. As with bail, a monetary amount is usually attached to the guarantee. If you breach your bail agreement, your guarantor may have to pay the amount of the guarantee (or in the case of a cash guarantee, the guarantor won’t get back the money they were required to pay up front). If you have any questions regarding Bail and/or Bail conditions Contact Us.